Born and raised in Bridgeport, Connecticut, Chuck Tarinelli started out as a real city boy without much opportunity to hunt. As a kid, he discovered the writings of Elmer Keith and Jack O’Connor. Soon he was reading everything he could find about hunting and wildlife and watching every nature and animal program that TV had to offer. This was the beginning of a passion that has lasted for almost six decades. The first real hunting Chuck did as a young man was with his English setter for the pheasants and ruffed grouse of New England. Later, he started pursuing deer and bear in the Green Mountains of Vermont. While a public school teacher, Chuck learned taxidermy, and for over 25 years he mounted hundreds of animals and fish as both a part-time and a full-time taxidermist. In 1984, Chuck did his first western hunt for elk and deer with an outfitter in northwestern Montana, and the following year returned to hunt antelope. 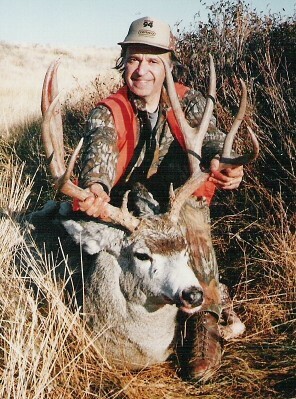 He has hunted in several states as well as in Canada for caribou. In 1993, Chuck and his wife, Linda, moved to Montana just for the outdoors activities that can be found in Big Sky country… and he hasn’t been disappointed one bit! Along with hunting, Chuck spends as much time as he can with Linda riding their horses in the mountains. Although Chuck’s legs and lungs keep trying to trick him into thinking the mountains are getting steeper, he still chases antelope, whitetails, muleys and elk. Recently, Chuck began training and hunting with a black lab, so once again he is hunting pheasants and grouse just as he did when he was a kid! Chuck joined our deer hunting forums back in December of 2007. It was very noticeable from his first posts that Chuck had a tremendous amount of outdoor related knowledge. He has contributed some amazing articles on topics such as taxidermy and handloading. His forum nickname is onehorse and you will see many informative posts contributed by him. To the new or even experienced hunter who may be considering handloading for the first time, the process may seem a little challenging.